Oracle America Inc., Redwood City, California, has been awarded $18,850,000 for fixed-price-level-of-effort task order. The order was placed under a previously awarded indefinite-delivery/indefinite-quantity (IDIQ) contract (M67854-17-D-7609) for continued post-deployment system support including, service management, service operations; production and pre-production system sustainment; solution development environment; enterprise training and training devices; product lifecycle support; and service transition for change requests and engineering change proposals. Work will be performed in Stafford, Virginia (50 percent); and Quantico, Virginia (50 percent), and is expected to be completed by December 20, 2019. 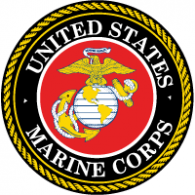 Fiscal year 2019 operations and maintenance funding, from the Marine Corps, in the amount of $18,850,000 will be obligated at the time of award and will expire at the end of the current fiscal year. The base contract was awarded on the basis of a sole source justification in accordance with Federal Acquisition Regulation subpart 6.302-1 (Only One Responsible Source). The Marine Corps Systems Command, Quantico, Virginia, is the contracting activity. The Marine Corps cyber arm is about ready to sign its first contract using the lightly regulated Other Transaction Authority given to select agencies to spur research, development and acquisition of bleeding-edge technologies without having to abide by the Federal Acquisition Regulation. Marine Corps Forces Cyberspace Command, or MARFORCYBER, officials expect to sign their first OT contract on or before Dec. 17, Command Executive Director Gregg Kendrick told Nextgov. Kendrick said MARFORCYBER, in conjunction with Marine Corps Systems Command, has been working on the contract since May, though the hard work began in earnest in July. The project will focus on cybersecurity and big data, including how to protect the Marines’ troves of data, as well as how to use that data to better protect the rest of the enterprise. The service cyber components that feed up to Cyber Command are responsible to man, train and equip their cyber warriors, meaning each service ends up using their own acquisition and service-specific models to do so. While Cyber Command possesses limited acquisition authority, this capability is nascent meaning the individual services still are charged with equipping their cyber forces based upon minimum operating capabilities operating capabilities Cyber Command’s Capabilities Development Group outlines. 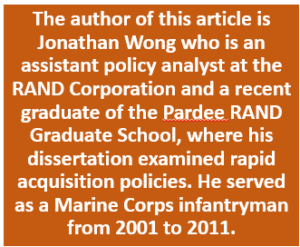 Marine Corps Forces Cyberspace Command does not possess direct acquisition authority and so they have to work through a variety of vectors including other commands within the service to procure both offensive and defensive capabilities. The Afognak Village Corporation, with 1,000 shareholders, operates about two dozen companies with nearly 5,000 employees across the United States and overseas. Its national and worldwide reach with hundreds of millions in contracts grew from subsidiaries that qualify for Small Business Administration contracting preferences with the Department of Defense, the Federal Emergency Management Agency, the Air Force, the Navy, the Army, the Marines, the Coast Guard and other agencies. The company describes its shareholders as descended from the village of Afognak, which was on an island just north of Kodiak hit hard by the tsunami that followed the 1964 earthquake. Its website features 382 job listings from Japan to Alabama and from Guantanamo Bay to Iraq. Afognak ranked 130th of the top 200 federal contractors in fiscal year 2015, according to a Bloomberg analysis, with $406 million in obligations. 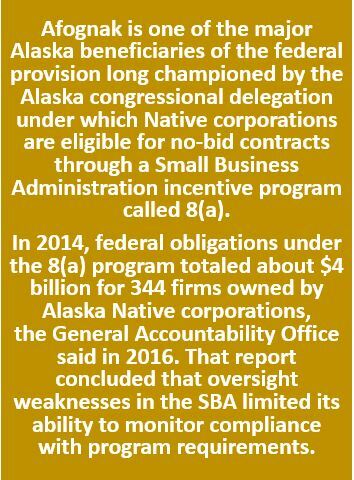 The process by which it emerged as a federal contracting heavyweight is at the heart of a whistleblower lawsuit with legal bills in the millions that is slowly progressing in federal court in Alaska. According to the lawsuit filed by a former company official, Afognak and its wholly owned subsidiary, Alutiiq, LLC, created “sham” companies to become eligible for more federal contracts than allowed.